Is the 3DS due for a Price Cut? The last generation of handheld systems saw a total dominance by Nintendo. Then again, when has Nintendo ever failed to dominate the handheld market? History looks to be repeating itself, with Nintendo and Sony each launching a handheld system in close proximity. As before, the Nintendo system has enough power to be competetive, but its true selling point is system features, which enhance gameplay. 3D effects and dual sceens are among the things that separate the 3DS from Sony’s Vita. In line with the last generation, Sony’s handheld system is set to launch less than a year after Nintendo’s, and outdo it graphically. If both companies are employing the same strategies, and last time around Nintendo outsold Sony by an almost 3 to 1 ratio, it would seem that Nintendo’s in no danger. However, one major difference presents itself this time. The DS had a major price tag advantage, as it cost $150 to the PSP’s $250. That’s a pretty massive difference, and for those on the fence about which system to buy, the extra $100 in their pocket may have been the difference maker. So with the holidays fast approaching, and Vita rumored to launch in Novemeber, the inevitable question is: Should Nintendo cut the price of the 3DS for the holidays? 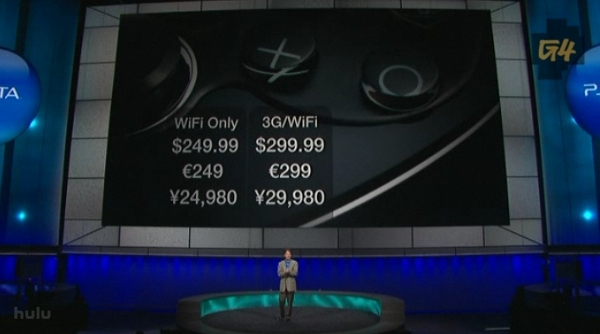 The Vita with WiFi only matches the 3DS in price. The 3DS didn’t have as strong of a launch as Nintendo had hoped for, and now competition is right around the corner. The holidays are always a critical time, as that’s when game sales are inevitably the highest. So going into the most important couple of months out of the whole year, is a price cut the right direction for the 3DS, in order to stay ahead of the Vita? At first glance it might appear that this is too soon for a price cut, but a little research shows that the DS received its first price cut about nine months after its launch. A November price cut for the 3DS would put it at nine months after its Japan launch, and eight months after its global launch, and thus, on par with what the DS did. So the timing is actually pretty close to what Nintendo did in the past, but at the same time, this is a different scenario. The 3DS did not have as strong of a launch as Nintendo had anticpated, and up until Ocarina of Time’s release, there was an almost complete lack of any first party titles. This is no coincidence, as these two things inevitably go hand in hand. So now that we finally have a handfull of titles like Kid Icarus and Mario 3DS coming out in time for the holidays, the 3DS is just now picking up steam. From a business standpoint, competition or not, a price cut at a time where sales are on the rise, rather than the decline, just isn’t logical. Heading into the holidays with a good lineup of first party titles, the 3DS is sure to sell millions of units over the months of November and December, and so you have to look at the statistics of pricing to see if it’s really worth it. Estimates are that a 3DS costs around $101 to manufacture. Thus, at a $250 price tag, there’s a profit of $149 being made collectively between Nintendo and all the various outlets they choose to sell the 3DS through, such as Walmart and Gamestop. So if we take a modest figure, say two million units sold over the holiday season, that’s a total profit of 298 million dollars. A $20 dollar price cut, in line with the DS, would mean Nintendo would have to sell over 310,000 more 3DS units in order to break even. So the question becomes, “Will a reduced price tag be enough to convince over 300,000 people who wouldn’t have bought a 3DS already to buy one?” This is just at a very modest estimate of 2 million units sold. It’s likely that that number will be closer to four or five million, making the number of extra 3DS sales to justify a price cut even higher. So in order for a price cut at this time of year to be justified, there has to be reason to believe that Nintendo will sell more units by doing so. It’s only a competitive edge over the Vita if it actually attracts a larger crowd with a lower price tag. So when November and December roll around and John and Jane consumer are looking to buy a new handheld system as a Christmas present, is a price cut going to be the deciding factor? I’m not sold on that. At this point in time, the 3DS and the Vita are a completely different beast, and their appeal is to a different market. Both systems have gotten some positive feedback from third party companies, and major third party titles which could appear on both systems are sure to start popping up in 2012 and 2013, but for now, their software lineups are completely different. In my mind, this will be the largest deciding factor. Does your kid want to play Mario or Little Big Planet? At this early stage in the life of the two consoles, it’s not going to come down to which system has the better graphics, the better features, or even the lower price tag. Until both get more established in the market (with Nintendo being closer to getting that done, since they launched first), it’s going to be about software this holiday season. Software, not price, will be the deciding factor this holiday season. Eventually, when the two markets begin to cross, then these other factors are going to become more important. Do you want the 3DS version of the game with 3D and Street Pass? Or do you want the Vita version with crisper graphics and Trophies? The developing companies themselves will begin to have to choose between the two systems as well, when it comes to exclusive third party titles. This is when features and price are going to make a big difference, but right now, the markets for the two systems are different enough that a price cut just isn’t going to make a difference. A price cut for the 3DS is definitely in order, and Nintendo can definitely afford it, but now is not the time. For Nintendo to cut the price of their hottest product when it’s just now gaining momentum and is heading into the two biggest sales months of the year would just be suicide. Regardless of price, Nintendo is going to outsell the Vita this holiday, because it has a firmer foundation, and it will have a more extensive and well-known software lineup by the time the Vita launches. After the rush of the holiday season begins to die down, and Vita begins to establish itself in the market, it becomes a different story. Eventually, Nintendo is going to have to make a price cut, and doing it before the Vita does the same will give them a competitive edge. It’s just not time yet.